The Tableau Table Writer extension allows for exporting data as .tde or .hyper Tableau extract files directly from RapidMiner Studio. The document will walk you through the installation and usage of this functionality. The extension runs on Windows (64 bit), Mac OS X (64 bit) and Linux distributions (64 bit). Tableau Data Extract API 2.0 for Tableau 10.5 or later. Note that Tableau SDK creates .tde extract files, Tableau Data Extract writes into the new .hyper format. There is no way to change from one format to the other without changing the setup and restarting RapidMiner Studio or Server. Download the appropriate API (C/C++/Java 64 bit version) from the official Tableau website (see links above) and follow the instructions below for Windows, Mac OS or Linux depending on the target platform. Note that the extension also supports the deprecated Tableau Extract API for backward compatibility, but it is no longer recommended. Tableau SDK and Extract API 2.0 installation instructions on Windows 64 bit platforms. The SDK/API is provided as ZIP archive. Extract all contents of the archive to your hard drive, e.g., to a folder under your Program Files folder. We will use the folder name Tableau Data Extract API as an example. Open the Advanced system settings in Windows and click on Environment Variables. Add the location of the Data Extract API to your system Path variable in System variables, e.g., if you extracted the API to C:\Program Files\Tableau Data Extract API, add ;C:\Program Files\Tableau Data Extract API\bin to the end of the variable value (please note the semicolon at the beginning). Add a new entry to the User variables and System variables lists as well called TAB_SDK_TMPDIR. Specify a location where your user has write privileges, e.g., C:\Users\<yourusername>\Documents, where <yourusername> is your user name. If this folder is not specified and the default (e.g. RapidMiner Studio installation directory) cannot be written by your user, you may get an error saying Hyper Server did not start correctly. It is also recommended to add TAB_SDK_LOGDIR to the User variables and System variables lists and set it to the same directory as TAB_SDK_TMPDIR points to. Data extraction operations are logged into a log file in the specified directory. 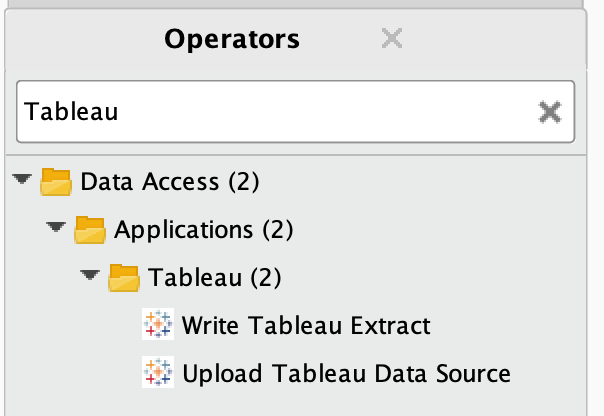 Tableau SDK and Extract API 2.0 installation instructions on Mac OS X (64 bit). The SDK/API is provided as image (.dmg) file. Open the .dmg file you downloaded. Drag all files in the Frameworks directory to /Library/Frameworks. You may be asked for your password. Specify environment variable TAB_SDK_TMPDIR to point to a location where your user has write privileges, e.g. /tmp. The steps for doing this may depend on your OS X version, see an example below. If this folder is not specified and the default (e.g. RapidMiner Studio installation directory) cannot be written by your user, you may get an error saying Hyper Server did not call back on the callback port. For older OS X versions, see this article. Tableau SDK and Extract API 2.0 installation instructions on Linux 64-bit distributions. The SDK/API is provided as an archive file (you may use .deb or .rpm versions as well). Download it to e.g., your $HOME/tableau folder. You can extract the files using the command line: tar xvf $HOME/tableau/*.tar.gz. This may extract a subdirectory with a name depending on the version, but we will ignore this subdirectoy for simplicity in the following steps when referring to a path. Make sure you check the path you are using. Add the location of the extracted bin directory to your PATH variable, e.g., if you extracted the API directly to $HOME/tableau, add $HOME/tableau/bin to the variable. You may need to specify environment variable TAB_SDK_TMPDIR to point to a location where your user has write privileges, e.g. /tmp. If this folder is not specified and the default (e.g. RapidMiner Studio installation directory) cannot be written by your user, you may get an error saying Hyper Server did not start correctly. 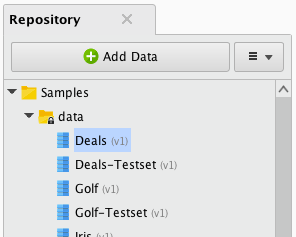 Edit the file and paste the absolute path of the tableausdk libraries. For example, following the $HOME/tableau/ pattern above, paste $HOME/tableau/lib64/tableausdk into the file. Set LD_LIBRARY_PATH environment variable to the absolute path of the tableausdk libraries. 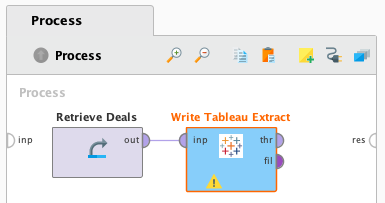 For example, following the $HOME/tableau/ pattern above, use $HOME/tableau/lib64/tableausdk. Run your process to start the export!